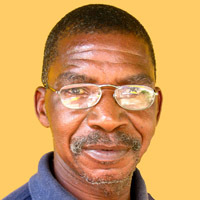 Abdul Mkura is an established painter. He was born in Nakapanya on 18th August 1954. He is the younger brother of Omary Amonde who was also his teacher in seventies. Mkura visited Japan 8 times, the first visit in 1992. His paintings were published by Kenji Shiraji in a Japanese book. He started his new style using black as background during the war in Iraq. In fact the big elephant is symbol of USA while the small one is the symbol of UK. The painting shows the close cooperation of these world powers.